In the face of climate disaster, a new environmental movement by the name of Extinction Rebellion has risen up, and they will make sure you hear their plea — which evidently is the plea of our planet. October 2018 was a big bad month in terms of news about the future of our living planet. The people of the world were confronted with two reports stating climate breakdown is happening right before our eyes and it’s going to destroy us and everything we touch in the foreseeable future. The first was the report by the UN Intergovernmental Panel on Climate Change (IPCC), essentially letting us know that the direness of our living planet’s condition is much worse than we thought it would be by 2018 and that we have less than a decade to start fixing it. The second piece of bad news came not much after the IPCC report in another report, this time published by the WWF, stating that since 1970 we, humanity, have destroyed 60 percent of all mammals, birds, fish, and reptiles. 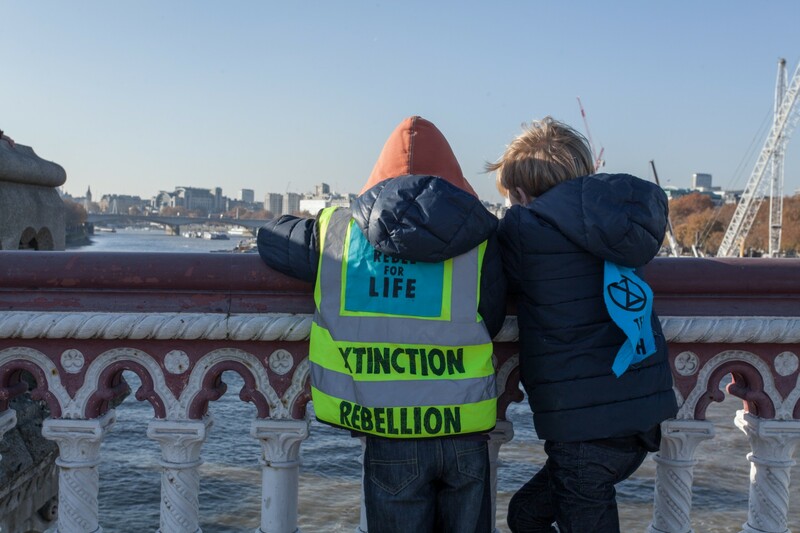 Extinction Rebellion launched on 31 October 2018, following a month that came with the two harrowing reports on the state of our planet and the living species that inhabit it. In short, Extinction Rebellion is an organisation and a social movement aiming to avert climate catastrophe and the destruction of our living planet. They’re here to drive radical change through nonviolent resistance. 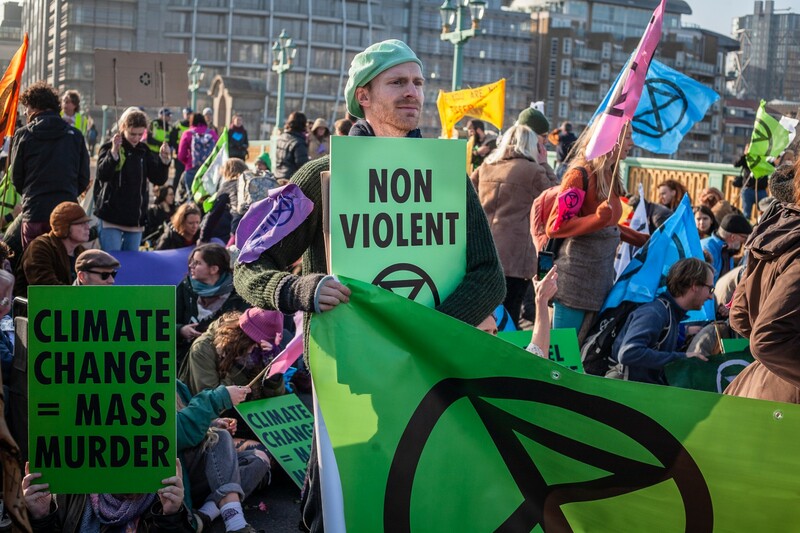 By no means, nonviolent means passive in Extinction Rebellion’s case (and many more movements that came before and inspired it). The Rebels have already taken to the streets and they’re not planning on stopping until sustainable, effective change is made. Since their official launch on October 31, which came in the form of a rally and a sit-in to block Parliament Square in London, Extinction Rebellion has been disrupting public space and public discourse. They have since glued their hands to the United Kingdom Department for Business, Energy and Industrial Strategy, blocked access to UK Prime Minister’s residence and office, simultaneously blocked five bridges in London, held a funeral service for the future of life, and swarmed London’s roads for several minutes at a time, gridlocking the city’s traffic. These are all well-planned actions of mass civil disobedience. They are respectful, nonviolent, considerate yet tenacious. Since their launch, thousands of rebels have gotten arrested and hundreds have gone to jail. This is all part of the plan. People who get arrested and people who go to jail are the ones who declared, upon joining the rebellion, they would be okay with these consequences. They are given all the information they need before the action and supported throughout the whole experience by the rebellion. Roger Hallam, one of Extinction Rebellion’s organisers and a PHD researcher on effective radical campaign design, explains that getting willingly arrested is a common practice in mass civil disobedience. It is a nonviolent way of grabbing both the public’s and the government’s attention. 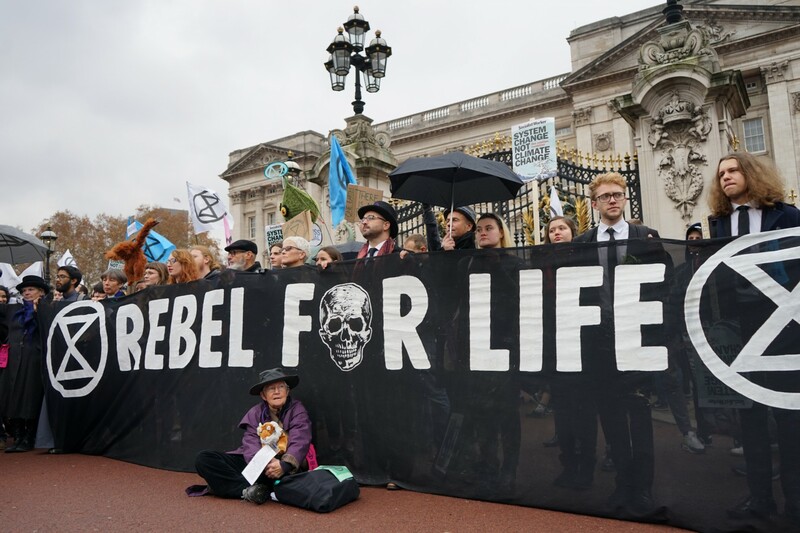 Such examples of mass civil disobedience serve Extinction Rebellion’s first and most immediate course of action: to inform the general public about the size and urgency of the crisis we are facing at this moment in time. They claim that our current political system and those in charge are failing to protect citizens of the world from future mass extinction and that mainstream media is complicit in this crime because they, too, are failing people by not sufficiently covering the breakdown of our living planet and its future effects on human life. The Extinction Rebellion’s message is loud, as demonstrated above, and clear. They want governments, starting with the government of their origin, The UK, to treat climate catastrophe as what it is: a looming crisis that will negatively affect all life on earth.